RPS composite beams are solving corrosion problems in the Flue Gas Desulphurization Industry. The environment inside SO2 absorber towers is very corrosive and can be problematic for metals. Due to the abrasive and corrosive atmosphere and chloride concentrations, these environments often require very expensive alloy materials for a variety of components including support beams. Composites beams developed by RPS are now being installed in FGD absorber towers. RPS is currently supplying 120 composite beams to be installed in 4 FGD absorber towers. The beams are being shipped in lots of 30 to be assembled in a 35 ft x 135 ft rectangular scrubber in two layers of 15 beams each. The beams will support the mist eliminators and associated ME wash pipe. The beams were designed to a customer defined envelope and were modeled by structural and composite engineers using RISA structural engineering software to meet the end-users performance criteria. The beams are of 3 specific designs: 8"W x 19"D x 26'L, 8"W x 19"D x 38'L with 1" camber, and 12"W x 25"D x 36'L with 1" camber. These beams are manufactured using RPS Flow Core infusion technology with vinyl ester resins and proprietary multi 3 dimensional fabrics that produce a laminate with a modulus of elasticity of > than 6 million psi. These laminates are incorporated in the top and bottom flanges of the beam. This high stiffness fabric is complimented with interlaced 45 degree bi directional fabrics that optimize load distribution between the compression and tension side of the beams in bending. RPS vacuum infusion technology ensures consistently high quality parts with repeatable and predictable properties. Once the vacuum infused beam is removed from the mold the beam is de burred of any resin flashing, visually inspected, and is moved to a test fixture. 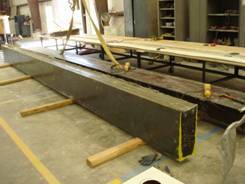 Each beam is performance tested using a 4 point bending test fixture that deflects the beams to full operational limits and from this the bending stiffness (EI) is determined and checked against specified stiffness. For this application the inherent corrosion resistance of RPS Composite beams was enhanced by the addition of an exterior proprietary erosion resistant liner which is applied after visual inspection and testing are complete. Attachments for pipe supports, guides, etc., are manufactured with traditional vacuum infusion laminates and are attached to the beams by contact molded secondary bonds. The overall assembly of 15 beams for each layer is shop trial fit as a system prior to beam shipment.